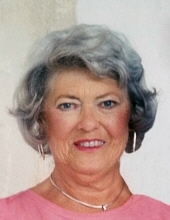 Shirley Martin Montgomery, 87, loving wife of John and mother of John Jr. and Robert passed peacefully at home Wednesday, December 6th with her sons by her side. She was born June 10, 1930 in Joplin, Missouri and was the daughter of Howard and Halce Martin. She graduated from Joplin High School and was a cadet colonel in R.O.T.C. and played flute in the band. While attending the University of Missouri she was also a member of Kappa Kappa Gamma Sorority. After graduating from the University of Missouri, Shirley taught in elementary school and often spoke of the year she had 57 first graders. For over four decades Shirley hosted hundreds of functions for the Department of Oral Surgery and the University of Iowa Dental School. She was active with P.E.O., Kappa Kappa Gamma Alumni and was a PTA President. Her passions were her family and friends in which she took special pride in entertaining. Shirley had the gift of making others feel welcome and comfortable. She also found time to express her artistic side by making handmade Christmas cards for 64 years. Shirley relaxed by either reading, planting flowers in her patio, and working on her many craft projects. She enjoyed vacationing with family and going on the annual fishing trips. Shirley was preceded in death by her husband and high school sweetheart of 62 years, Dr. John C. Montgomery. She is survived by son John (Tammy), son Robert (grandson Justin), sister-in-law, Mary Lou Blair, nephew, Dr. Brook Blair (Helen and grandniece, Nora Lou). Visitation will be held at Lensing Funeral Service in Iowa City on Tuesday, December 19th between 4:00pm -7:00pm. A private burial will be held in Joplin, Missouri on January 5, 2018.